I have a question about pigeon spikes, though. They say that pigeons are intelligent, wouldn't land on them, and therefore there's no danger. But what happens when they fight, get chased by predators, etc? Surely they can get harmed if they fall or get pushed onto them... I've also read accounts of injuries caused by spikes, but I have no first-hand experience of this. Have you? Whoa, I couldn't even read all of that. Boatload of information, that. I agree about the spikes, tho. I've seen my birds being pretty clumsy when they get bullied. I wonder if they could make them safer for clumsy pidgies by making ones with blunt, rounded tips. Would still keep them from landing but wouldn't injure them if they crashed on them. I think they are dangerous too. I've also read accounts of injuries caused by spikes, but I have no first-hand experience of this. Have you? I don't have any personal experience either, Teresa, but I have also read some sad stories about pigeon encounters with them. They are very dangerous and as far as I'm concerned inhumane! I have also read about pigeons being impaled by them. I would have thought that in this day & age of animal rights someone would come up with a better idea that won't in flick bodily harm to keep pigeons from roosting in certain spots. Some good info - well researched, however, I agree about the spikes. They are dangerous. 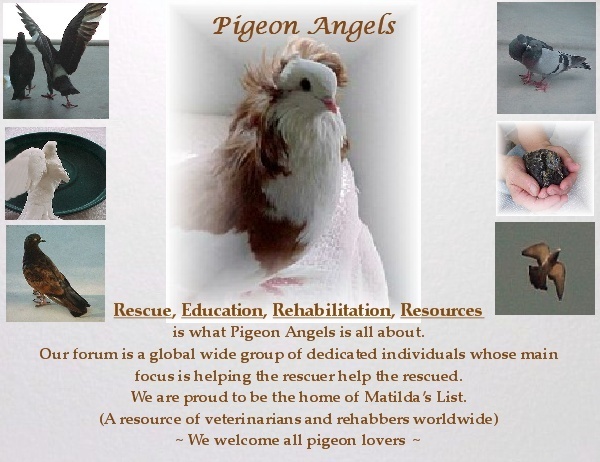 I'll have a proper read through the website later (getting late now over here) and see how pigeon friendly the company is. I believe this site is PiCAS . It's very disappointing to see them supporting the use of spikes. I also remember one of our members, Pigeon, speaking very strongly against all methods of pigeon population control, whilst being in favour of spikes as perching deterrents. Personally I couldn't see how metal spikes could be considered safe, and looked for alternatives in the article. There were some of a different composition (a type of plastic, maybe?) but the metal ones were supposed to be best. Your opinions confirmed my concerns. We are still a long way away from the perfect solution. I don't know their opinion on spikes. An organisation called the Pigeon Control Advisory Service International (PiCAS International) pioneered a method of controlling feral pigeon populations that not only deals with the main problem associated with pigeons, the soiling of buildings, but also reduces pigeon flock size humanely and effectively via birth control. The system is discussed in detail in the Artificial Breeding Facilities document that can be found in the Product Review Section. The system is simple and inexpensive to set up and maintain and results in a massive decrease in pigeon flock size if implemented as recommended. The system is now used to great effect in many European countries and some users of the system have even suggested that the degree of control gained over pigeon flock size by this option negates the need to restrict the feeding of pigeons . However, even if a holistic and sustainable control system of this type is initiated, there is a clear need to reduce the use of lethal controls and stop the irresponsible feeding of feral flocks. An organisation called the Pigeon Control Advisory Service International (PiCAS International) pioneered a method of controlling feral pigeon populations that not only deals with the main problem associated with pigeons, the soiling of buildings, but also reduces pigeon flock size humanely and effectively via birth control. Oh, yeah, I see what you mean. I've been meaning to read up on this type of pigeon population control and write about it for my blog, but never seem to get my act together. But it is all very interesting. "The use of artificial breeding facilities (ABFs) such as dovecotes or pigeon lofts as a method of pigeon control is becoming increasingly popular in Europe with many users experiencing astonishing results. This control was pioneered by the Pigeon Control Advisory Service (PiCAS International) in the 1970s as a means of humanely and naturally controlling pigeon flock size without the need to resort to invasive and ineffective lethal controls. " Just had a look at PiCAS's website and yes, they do advocate using spikes. To be honest, if they are dangerous and a problem to pigeons then I think we'd see pigeons or other birds impaled on them. They do look dangerous and very sinister, but I've seen photos of pigeons nesting amongst them, so even though I wouldn't personally use them (I just wouldn't want to risk it) I don't think they are as big of a threat as other anti-pigeon devices. I do agree with you and the site, other than the spike recommendation, has some very good information. I especially enjoyed the historical background, and how different cultures and religions lead to different attitudes towards pigeons.